In 1492, Columbus sailed the ocean blue! Disappointingly, this phrase doesn’t turn up anywhere in the EEBO-, ECCO-, or Evans-TCP corpora. Portrait of Columbus from John Ogilby's 1671 "America : being the latest, and most accurate description of the new vvorld"
In fact, according to a visualization generated by the Google N-Grams viewer, the familiar rhyme doesn’t appear in print at all until just before 1900. However, EEBO-TCP does contain a number of books detailing the exploration of the “New VVorld,” including Columbus’ infamous first voyage, which left Spain on August 3, 1492, and sighted land on October 12. However, it seems that by the time Christopher and Bartholomew caught up with one another (in Hispaniola!) Columbus had already been sponsored by Ferdinand and Isabella of Spain and made his voyage west. Searches for “Columbus” and “Christopher Columbus” in EEBO-TCP returned lots of hits, but it seemed like other interesting results might not have turned up at all because of variation in the spelling of Columbus’ name. So, I tried searching for one other common possibility, “Colonus” (this was by no means an exhaustive search for the man!). This revealed that both “Columbus” and “Colonus” were used frequently (even in the same work!) but that one translator in particular, Richard Eden, who compiled and translated into English two histories of the new world that are currently in EEBO-TCP, greatly preferred Colonus to Columbus. This challenge of capturing the most authoritative (or the most fruitful) version of a personal name is a particular challenge when searching the EEBO-TCP corpus. Our mission is to transcribe the original works as diplomatically as possible and to key and encode as many works as efficiently we can. As a result, the TCP does not systematically identify and normalize all personal names (or place names, or dates, for that matter). We leave this work to the scholars working with these texts. However, there is one situation in which the TCP can consistently make it a bit easier to find the person you’re looking for: when the subject appears in an illustration. One of our markup reviewers, John Pas, described the experience of doing exactly this while reviewing John Ogilby’s America: being the latest, and most accurate description of the newvvorld containing the original of the inhabitants, and the remarkable voyages thither, the conquest of the vast empires of Mexico and Peru and other large provinces and territories. (The full text of this book will be released to EEBO-TCP partners as part of a large batch later this fall). The most interesting issue that I encountered in this book was concerning the treatment of indigenous names and places. For example, on page 96, image 64, there is an engraving with the caption “ATHABALIBA ultimus Rex Peruanorum”. Thinking that it was really cool to find an engraving of the last “Peruvian king,” I tried to find more information on Athabaliba. He wasn’t in Wikipedia, and the search returns for “Athabaliba” on Google returned only my book. The “related searches” listed an “Atabalipa” as well, which returned a Wikipedia article on a fellow named “Atahualpa,” who was in fact the last “Sapa Inca” or Incan sovereign, the “ultimus Rex Peruanorum” as it were. When marking up the texts, the TCP uses the <FIGURE> element to indicate the presence of an illustration or engraving. Any words that actually appear in the image would be transcribed inside this element. But the schema also allows a child element, <FIGDESC>, within which the reviewer can add a short prose description of the image. This is where our reviewers can also add the normalized/modern version of the name. In this case, John opted to use the modern spelling of Atahualpa’s name (also the version recommended by the Library of Congress Name Authority File) in <FIGDESC>. 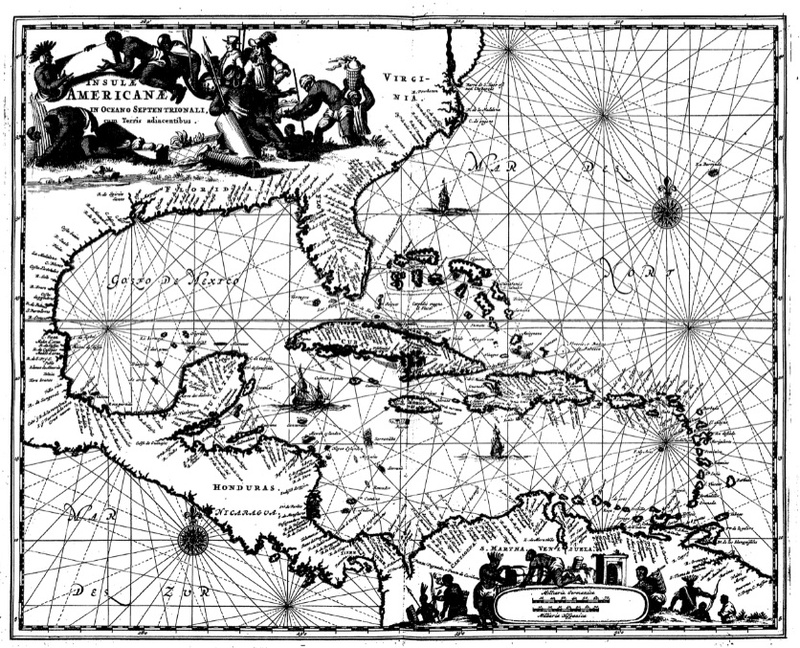 Map of the Caribbean and surrounding areas, from John Ogilby's 1671 "America : being the latest, and most accurate description of the new vvorld containing the original of the inhabitants, and the remarkable voyages thither, the conquest of the vast empires of Mexico and Peru and other large provinces and territories"
As John put it, the very process of reviewing and marking up these works calls for a bit of the spirit of exploration. We hope that you, too, will spend some time today exploring these, and other, TCP texts!